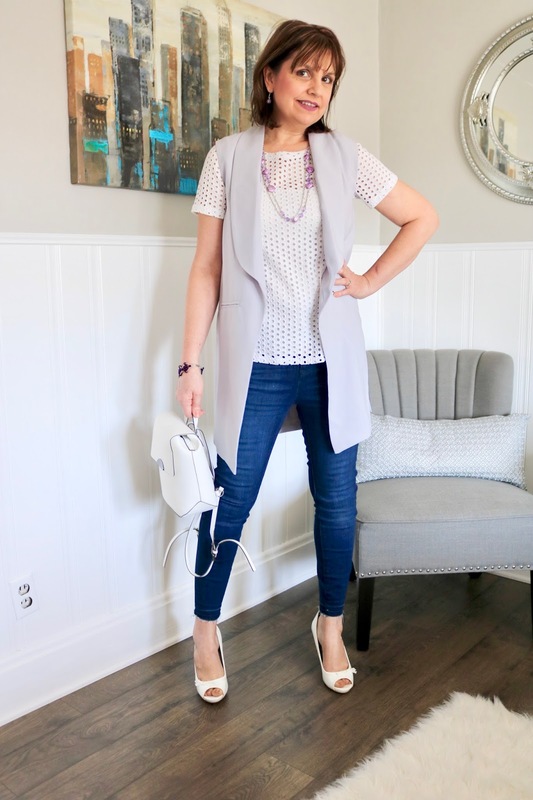 In my fourteenth Fix from Stitch Fix, one of the items I received was this lavender vest. In that same Fix I received two dresses, a pair of lavender skinny jeans, and a floral top. I've already shown you the lavender skinny jeans HERE and the floral top in this post HERE. For this Fix, I asked my stylist to send me items in the Lavender shade since it was Pantone's color of the year. She sent me three lavender items, but I only kept one of them: the floral top (I also kept the two dresses). This vest is cute, but I didn't like that I couldn't button it or tie it shut. Because of the loose, boxy cut, it just wasn't very figure flattering. I also did not think it represented my style nor was it suitable for my casual lifestyle. If I was a working woman who required a career wardrobe, I might have kept it. But my life essentially consists of cooking, cleaning, crafting, gardening, traveling, shopping, and going to church. I was actually upset that I received this vest, because if I would have gotten just one more item I really liked I would have kept the entire Fix and received 25% off. I ended up having to send the cute pair of lavender skinny jeans back too, or my dollar total would have been way to high. For the photo shoot, I styled the vest with a white eyelet top (old, Old Navy), and dark denim high-rise skinny jeans with a released hem from Charlotte Russe. The straps on my bag were too tempting to Jackson. He had to "catch them" and chew on them. I thought this white back-pack bag from JCPenney (old) coordinated well with my white top and shoes. 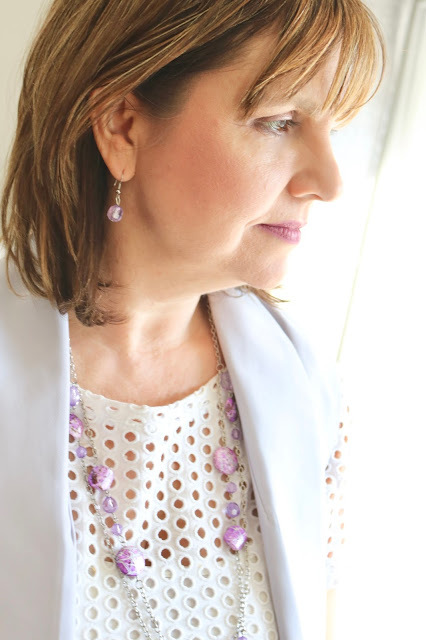 I picked a variety of purple jewelry to compliment the lavender top (all old). I love this photo of Jackson. He looks so handsome! So what do you think? Did I make the right decision to send this back? I'd love to hear your thoughts in the comments below. It's a cute look and such a pretty color. But it's understandable to send it back if you wouldn't get much wear out of it and if it isn't practical to your lifestyle. Love the jeans I might have to check out Charlotte Russe to see if they have them in a short lengths. I've stayed away from distressed denim, but the open hem might be just the distressing I can live with LOL, and it looks really cute! Jackson's so cute! Glad he's joining you in the photo shoot! How well he blends in with the fur blanket! Thanks Elli! I purchased three pairs of jeans at Charlotte Russe, and I love them all. They fit fabulous on me. I'm not sure if they have short lengths. I'm 5'7 and the length is perfect for me. I totally get staying away from distressed denim. I can handle a little distressing, but not much. And I'm always thrilled when Jackson joins us for the photography shoot. Lavender is one of my favorite colors, especially for spring! This vest is so pretty and I love your eyelet top. Beautiful look Amy! Thanks Elise. Lavender is one of my favorite colors for spring too! I do LOVE the vest! I would also wear it for our Friday night date nights. But for your lifestyle, you obviously made the right choice. I'm so into lavender too right now. It's such a pretty and refreshing color! Love the longline vest too! Thanks an Patti! I am having fun with Stitch Fix! Thanks so much Chanda! I was happy to have a stylish room with good lighting to take pictures all winter since it was soooo cold!